"Humeral" redirects here. It is not to be confused with humoral immunity. The humerus (/ˈhjuːmərəs/, plural: humeri) is a long bone in the arm that runs from the shoulder to the elbow. It connects the scapula and the two bones of the lower arm, the radius and ulna, and consists of three sections. The humeral upper extremity consists of a rounded head, a narrow neck, and two short processes (tubercles, sometimes called tuberosities). The body is cylindrical in its upper portion, and more prismatic below. The lower extremity consists of 2 epicondyles, 2 processes (trochlea & capitulum), and 3 fossae (radial fossa, coronoid fossa, and olecranon fossa). As well as its true anatomical neck, the constriction below the greater and lesser tubercles of the humerus is referred to as its surgical neck due to its tendency to fracture, thus often becoming the focus of surgeons. The word "humerus" is derived from Latin: humerus, umerus meaning upper arm, shoulder, and is linguistically related to Gothic ams shoulder and Greek ōmos. The head of the humerus is a hemisphere that faces medially and articulates with the glenoid fossa of the shoulder joint. 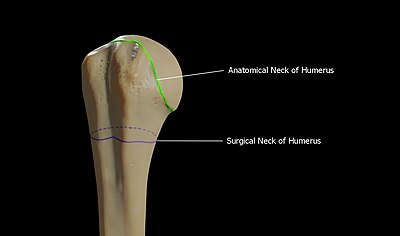 The anatomical neck is the groove that surrounds the articular surface of the head of the humerus. This is where the joint capsule is attached. The surgical neck however, is a segment present inferior to the humeral head. 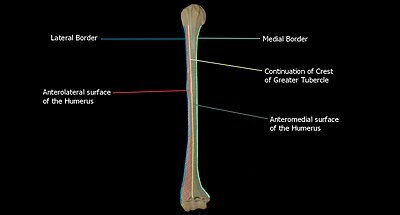 This acts as a connection between the head and the shaft of the humerus. The greater tubercle is a large, posteriorly placed projection that is placed laterally. The greater tubercle is where supraspinatus, infraspinatus and teres minor muscles are attached. The crest of the greater tubercle forms the lateral lip of the bicipital groove and is the site for insertion of pectoralis major. 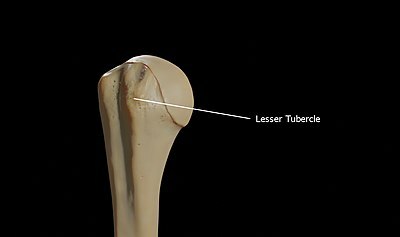 The lesser tubercle is smaller, anterolaterally placed to the head of the humerus. The lesser tubercle provides insertion to subscapularis muscle. Both these tubercles are found in the proximal part of the shaft. The crest of the lesser tubercle forms the medial lip of the bicipital groove and is the site for insertion of teres major and latissimus dorsi muscles. 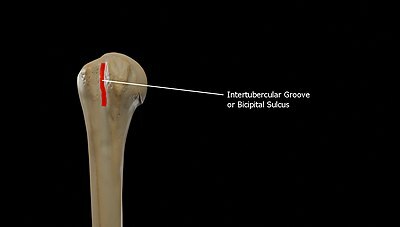 The intertubercular groove or also known as the bicipital sulcus is a deep groove that begins between the two tubercles and extends longitudinally down the proximal shaft of the humerus. The long head of biceps brachii muscle runs along this groove. The transverse humeral ligament connects the lesser and greater tubercles and bridges this groove to form a canal. The Anteromedial Surface is the area between the medial border of the humerus to the line drawn as a continuation of the crest of the greater tubercle. 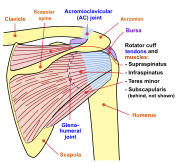 The Anterolateral Surface is the area between the lateral border of the humerus to the line drawn as a continuation of the crest of the greater tubercle. The Posterior Surface is the area between the medial and lateral borders. The Deltoid tuberosity is a roughened surface on the lateral surface of the shaft of the Humerus and acts as the site of insertion of deltoideus muscle. The posterorsuperior part of the shaft has a crest, beginning just below the surgical neck of the humerus and extends till the superior tip of the deltoid tuberosity. This is where the lateral head of triceps brachii is attached. The radial sulcus, also known as the spiral groove is found on the posterior surface of the shaft and is a shallow oblique groove through which the radial nerve passes along with deep vessels. 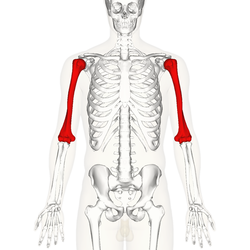 This is located posteroinferior to the deltoid tuberosity. The inferior boundary of the spiral groove is continuous distally with the lateral border of the shaft. The nutrient foramen of the humerus is located in the anteromedial surface of the humerus. The nutrient arteries enter the humerus through this foramen. Olecranon fossa is the posterior hollow part on the distal humerus which accommodates the olecranon process of the ulna during extension of the elbow. The coronoid fossa is the medial hollow part on the anterior surface of the distal humerus. 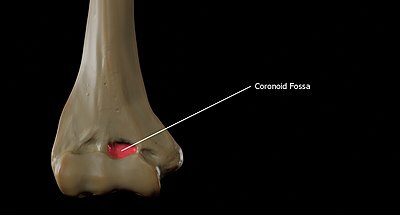 The coronoid fossa is larger than the olecranon fossa and receives the coronoid process of the ulna during maximum flexion of the elbow. The Radial fossa is located laterally on the anterior surface of the distal forearm and this part receives the head of the radius during maximum flexion of the elbow. 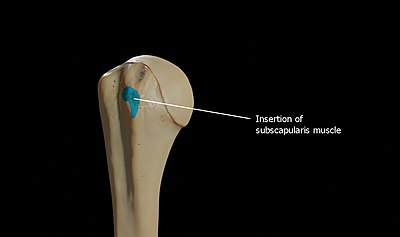 The Capitulum is a rounded eminence forming the lateral part of the distal humerus. The head of the radius articulates with the capitulum. 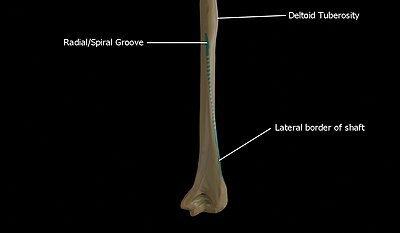 The trochlea is spool-shaped medial portion of the distal humerus and articulates with the ulna. The lateral epicondyle is the non-articular lateral bulge of bone located superior and lateral to the capitulum. The radial collateral ligament attaches to the lateral epicondyle. The common tendon of the extensor muscles of the forearm and the supinator muscle originate on the lateral collateral ligament. The Medial epicondyle is the non-articular medial bulge of bone located superior and medial to the trochlea. The medial epicondyle is more prominent than the lateral epicondyle and the ulnar collateral ligament is attached here along with the forearm flexors. The Medial supracondylar crest forms the sharp medial border of the distal humerus continuing superiorly from the medial epicondyle. The Lateral Supracondylar crest forms the sharp lateral border of the distal humerus continuing superiorly from the lateral epicondyle. At the shoulder, the head of the humerus articulates with the glenoid fossa of the scapula. 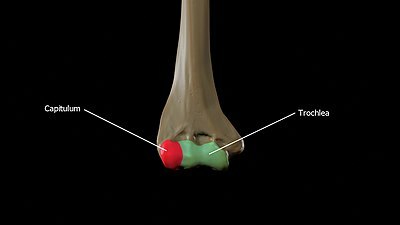 More distally, at the elbow, the capitulum of the humerus articulates with the head of the radius, and the trochlea of the humerus articulates with the trochlear notch of the ulna. The left shoulder and acromioclavicular joints, and the proper ligaments of the scapula. The axillary nerve is located at the proximal end, against the shoulder girdle. Dislocation of the humerus's glenohumeral joint has the potential to injure the axillary nerve or the axillary artery. Signs and symptoms of this dislocation include a loss of the normal shoulder contour and a palpable depression under the acromion. The radial nerve follows the humerus closely. At the midshaft of the humerus, the radial nerve travels from the posterior to the anterior aspect of the bone in the spiral groove. A fracture of the humerus in this region can result in radial nerve injury. The ulnar nerve lies at the distal end of the humerus near the elbow. When struck, it can cause a distinct tingling sensation, and sometimes a significant amount of pain. It is sometimes popularly referred to as 'the funny bone', possibly due to this sensation (a "funny" feeling), as well as the fact that the bone's name is a homophone of 'humorous'. It lies posterior to the medial epicondyle, and is easily damaged in elbow injuries. 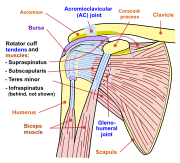 The deltoid originates on the lateral third of the clavicle, acromion and the crest of the spine of the scapula. It is inserted on the deltoid tuberosity of the humerus and has several actions including abduction, extension, and circumduction of the shoulder. 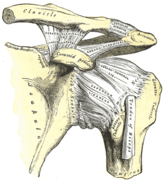 The supraspinatus also originates on the spine of the scapula. It inserts on the greater tubercle of the humerus, and assists in abduction of the shoulder. The pectoralis major, teres major, and latissimus dorsi insert at the intertubercular groove of the humerus. They work to adduct and medially, or internally, rotate the humerus. The infraspinatus and teres minor insert on the greater tubercle, and work to laterally, or externally, rotate the humerus. In contrast, the subscapularis muscle inserts onto the lesser tubercle and works to medially, or internally, rotate the humerus. The biceps brachii, brachialis, and brachioradialis (which attaches distally) act to flex the elbow. (The biceps do not attach to the humerus.) The triceps brachii and anconeus extend the elbow, and attach to the posterior side of the humerus. The four muscles of supraspinatus, infraspinatus, teres minor and subscapularis form a musculo-ligamentous girdle called the rotator cuff. This cuff stabilizes the very mobile but inherently unstable glenohumeral joint. The other muscles are used as counterbalances for the actions of lifting/pulling and pressing/pushing. Primitive fossils of amphibians had little, if any, shaft connecting the upper and lower extremities, making their limbs very short. In most living tetrapods, however, the humerus has a similar form to that of humans; connecting their extremities. In many reptiles and some primitive mammals, the lower extremity includes a large foramen, or opening, which allows nerves and blood vessels pass through. Position of humerus (shown in red). Animation. Humerus - inferior epiphysis. Anterior view. Humerus - inferior epiphysis. Posterior view. Humerus - superior epiphysis. Anterior view. Humerus - superior epiphysis. Posterior view. Elbow joint. Deep dissection. Anterior view. Elbow joint. Deep dissection. Posterior view. During embryonic development, the humerus is one of the first structures to ossify, beginning with the first ossification center in the shaft of the bone. Ossification of the humerus occurs predictably in the embryo and fetus, and is therefore used as a fetal biometric measurement when determining gestational age of a fetus. At birth, the neonatal humerus is only ossified in the shaft. The epiphyses are cartilaginous at birth. 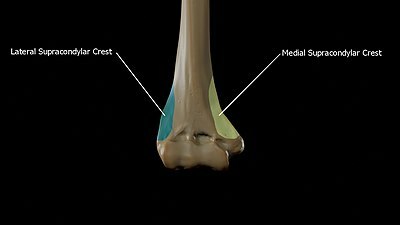 The medial humeral head develops an ossification center around 4 months of age and the greater tuberosity around 10 months of age. These ossification centers begin to fuse at 3 years of age. The process of ossification is complete by 13 years of age, though the epiphyseal plate (growth plate) persists until skeletal maturity, usually around 17 years of age. ^ Harper, Douglas. "Humerus". Online Etymology Dictionary. Retrieved 6 November 2014. ^ "Humerus Anatomy at DocJana.com". docjana.com. ^ "Funny Bone". Word Detective. ^ Romer, Alfred Sherwood; Parsons, Thomas S. (1977). The Vertebrate Body. Philadelphia, PA: Holt-Saunders International. pp. 198–199. ISBN 0-03-910284-X. ^ Wiśniewski, Marcin; Baumgart, Mariusz; Grzonkowska, Magdalena; Małkowski, Bogdan; Wilińska-Jankowska, Arnika; Siedlecki, Zygmunt; Szpinda, Michał (October 2017). "Ossification center of the humeral shaft in the human fetus: a CT, digital, and statistical study". Surgical and radiologic anatomy: SRA. 39 (10): 1107–1116. doi:10.1007/s00276-017-1849-4. ISSN 1279-8517. PMC 5610672. PMID 28357556. Wikimedia Commons has media related to Humerus. "Humerus" . New International Encyclopedia. 1905.